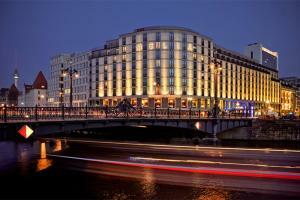 Set in the heart of Berlin, this hotel is just moments away from Brandenburg Gate, Museum Island and Alexanderplatz. Accommodations include 364 elegant rooms and suites, some offering views of Friedrichstraße Am Weidendamm and the River Spree. Guests have a variety of dining options including Restaurant Café Madrid with panoramic views of the River Spree, Tapas Bar and more. Located in Berlin, Germany, near Museum Island.